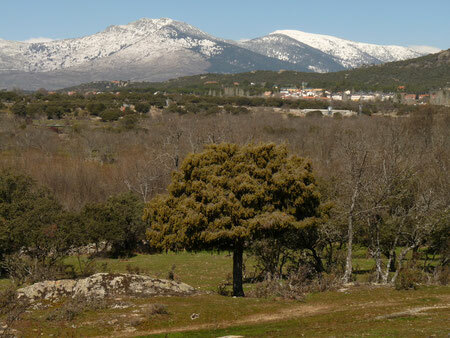 "Dehesa" Habitat: eine typische spanische Landschaf mit Steineichen (Quercus ilex) und Wacholder (Juniperus oxycedrus). UVS für den Bau einer Umgehungsstraße in Collado Mediano (Madrid, Spanien). Experience includes management of Environmental Impact Assessment (EIA) for power lines, ports and other utilities infrastructures, railways, roads, and wind farms and other industrial facilities. His experience has encompassed the management of projects from field surveys to final reports. - Environmental Impact Study (EIA) of Collado Mediano bypass road, Madrid. Auding 2011. - 4 Environmental Impact Study (EIA) of 4 wind farms in Tarragona. For AMBIO. Auding 2010. - Director of the Environmental Impact Study (EIA) of Photovoltaic Plant of Alcornocalejo (Villanueva del Río y Minas, Sevilla), 19 MW, for Clean Energy Investment. Idom Internacional, 2008. - Director of the Environmental Impact Study Memories of 3 dams for Eresma river regulation. For ACUADUERO, S.A. 2008. - Drawing up of environmental chapters for 6 off-shore wind farms in the Spanish coast. For CEOWIND-Capital Energy. Idom Internacional 2007. - Environmental Impact Study (EIA) of País Vasco-Cantabria gas-pipeline. For NATURGAS. Idom Internacional 2007. - Environmental Impact Study (EIA) of Chozas de Canales Airfield in Toledo. For Aero-Hobby. Idom Internacional 2007. - Director of the Environmental Impact Study (EIA) of Caesar's Palace Hotel Casino in Ciudad Real. For HARRAH’S (Las Vegas, U.S.A.). Idom Internacional 2006. - Director of the Environmental Impact Study (EIA) of a Highway section in Murcia. For Ministerio de Fomento. Idom Internacional 2003. - Director of the Environmental Impact Study (EIA) of Azorin and Marquesado dams in Ebro Diversion Project. For TRASAGUA. Idom Internacional 2003. - Contribution for the Environmental Impact Study (EIA) of San Sebastian airport modifications. For AENA. Idom Internacional 2003. - Environmental Report of Railway section in Cartagena, Murcia. For Ministerio de Fomento, Spanish Government. Idom Internacional 2002. - Director of the Environmental Impact Study (EIA) of Maestrazgo Electric Conversion Station. For REE. Idom Internacional 2002. - Environmental Impact Study (EIA) of Olmedo Electric Conversion Station. For REE. Idom Internacional 2002. - Environmental Impact Study (EIA) of Maestrazgo Electric Conversion Station, Castellón. For REE. Idom Internacional 2002. - Environmental Impact Study (EIA) of an Electric Line of 400 kV between Trives (Orense) and Tordesillas (Valladolid). For REE. Idom Internacional 2002. - Supervision of environmental study of the Airbus Assembly Plant in Puerto Real (Cádiz). For AIRBUS INDUSTRY. Idom Internacional, 2002. - Environmental Impact Study (EIA) of Potabilization Plant in Ablaneda (Asturias). For CONSORCIO DE AGUAS DE ASTURIAS. Idom Internacional 2002. - Initial Environmental Impact Study (EIA) of Córdoba airport remodelling. For AENA. Idom Internacional 2002. - Environmental Impact Study (EIA) of San Martín de la Vega gas pipeline (Madrid). For GAS NATURAL SDG, S.A. Idom Internacional 2001. - Environmental report of the Jerez de la Frontera Mall (Cádiz). For RIOFISA. Idom, 2001. - Environmental Impact Study (EIA) of El Palmar o Electric Conversion Station, Murcia. For REE. Idom Internacional 2000. - Environmental Impact Study (EIA) of 400 kV electric line in Carrascoy Nature Park. For REE. Idom Internacional 2000. - Environmental report of Santa Catalina dump site in Ceuta. For Government of Autonomous City of Ceuta. Idom Internacional 2000. - Environmental Impact Study (EIA) of La Gavia waste water plant, Madrid. For ACS. Idom Internacional 1999. - Environmental Impact Study (EIA) of Oyambre Golf Course. For Mayorazgo de Santa Marina. Medio Ambiente Consultores 1999. - Environmental Impact Study (EIA) of Castañeda Scrapyard. For Chatarrería Castañeda, Cantabria. Medio Ambiente Consultores 1998. - Supporting of Environmental Impact Study (EIA) of M-45 Motorway in Madrid. For MOPTMA. Dendros S.L. 1997. - Supporting of Environmental Impact Study (EIA) of Salamanca Bypass, N-620, in Salamanca. For MOPTMA. - Environmental assessment of the new national irrigation plan. For IRYDA, Agricultural Ministry. Dendros S.L. 1996.